Flow monitor with safety function in accordance with VdTÜV code of practice "Flow 100"
Typical markets for these products are the shipbuilding industry, process heating technology, the heating, ventilation and air-conditioning industries, the water/wastewater industry, and machine building and plant construction. For these, the main function of the measuring instruments is the monitoring of filters, compressors and pumps. These instruments are primarily used as flow monitors in heat transfer oil plants. 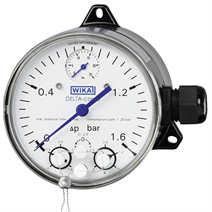 Wherever a differential pressure must be displayed locally and, at the same time, electrical circuits need to be switched safely dependent on a defined differential pressure, the DELTA-comb finds its use. As the pressure passes above or below a defined set point, the switching operation is triggered. The switch point is accessible from the front and can be set in the range of 10 ... 100 % of the full scale value via an assistant scale. 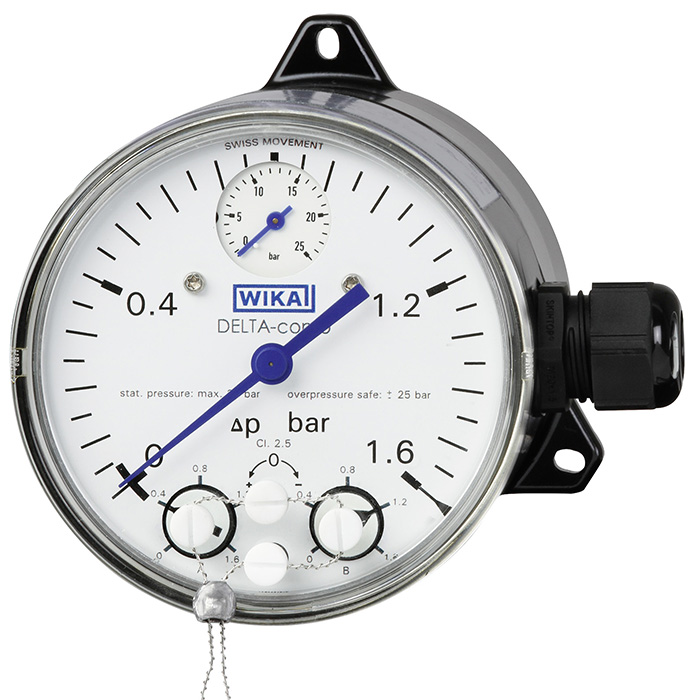 Due to the mechanical indication, the differential pressure can be read securely, even if the voltage supply is lost. The robust aluminium case and shatterproof window enable a long service life of the product, even under harsh ambient conditions. As a result of the low measuring range of 0 … 250 mbar, the instrument can also be used for applications with low differential pressures. A special feature of the DELTA-comb with component testing lies in the large variety of approvals and certifications. These assure the suitability for use in each application.